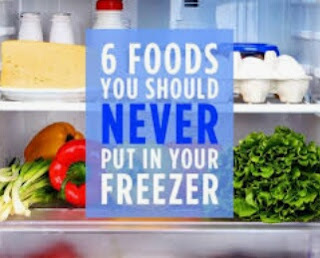 There are certain foods that shouldn’t be kept in the freezer as this can lead to the growth of bacteria or even health risks. Potatoes have a high water content, so after being stored in the freezer, you could be left with a mushy, soft potato. Potatoes are best kept in a cool, dry place. If you really want to freeze them, you should try cooking them first. Foods that were fried will lose their crunchy taste if you put the leftovers in the freezer. The best advice is to eat all of your fried food in one go or fry the ones you can eat. You should never keep eggs that are still in their eggs in the freezer. The water content inside the egg expands when frozen, which can cause the outer shell to crack and be vulnerable to bacteria. If you want to freeze your eggs, always take them out of the shell, mix until well blended and put in the freezer. Freezing cooked rice and pasta is never a good idea. It becomes mushy flavourless. In the end, you will have no choice than to throw it away! Any vegetable or fruit that has a high water concentration, like cucumber, tomatoes, salad greens, and watermelon will not survive the freezer because the water inside quickly allows them to become mushy. Dairy products should never be kept in the freezer because it forces the enzymes in dairy to separate. If you do not want your milk, yoghurt and cheese to become watery, do not put it in the freezer.